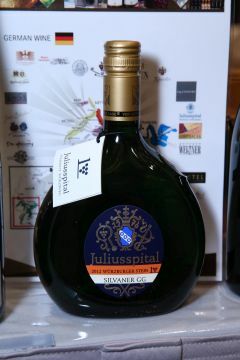 Silvaner Trocken, a rarely exported white wine from the Franken region in Germany. The Silvaner grape variety is hailed as the queen of white wines. Signorello Hope's Cuvee Chardonnay 2015 from Napa Valley. 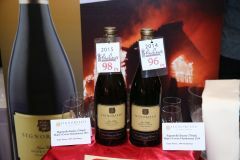 Total production of this 2015 wine is less than 6,000 cases annually and often significantly less, rated 98 by Robert Parker. HKTDC Deputy Executive Director Benjamin Chau (6th from L) joins guests at today's press conference. HONG KONG, Oct 24, 2017 - (ACN Newswire) - Organised by the Hong Kong Trade Development Council (HKTDC), the Hong Kong International Wine & Spirits Fair will be held from 9-11 November (Thursday to Saturday) at the Hong Kong Convention and Exhibition Centre (HKCEC). The fair's 10th edition will feature a record 1,070 exhibitors from 37 countries and regions, with more than 70 events organised. On the fair's last day (Saturday, 11 November), the show will open its doors to public visitors with admission tickets. Wine lovers will be able to enrich their knowledge of wine and experience the high-spirited atmosphere of this signature regional wine event. At the press conference, HKTDC Deputy Executive Director Benjamin Chau said: "In the first eight months of this year, Hong Kong's wine imports reached HK$7.56 billion. Most of the wines were imported from France, the United Kingdom and Italy. Imports from the United States and Italy even recorded a 16 per cent and 22 per cent growth respectively. In terms of exports, Hong Kong's wine exports amounted to HK$2.96 billion. The Chinese mainland is Hong Kong's largest export market, followed by Macau and Vietnam." After the Hong Kong Government eliminated all duty-related customs and administrative controls on wine in 2008, wine imports jumped from HK$1.6 billion in 2007 to HK$12 billion in 2016, up more than 700 per cent. Hong Kong has also developed into the region's wine trading and distribution centre, and serves as a gateway for wines entering the Chinese mainland. Since November 2015, the agreement facilitating the import of wine into the mainland through Hong Kong has been expanded to cover all ports in Beijing, Tianjin, Shanghai, Guangzhou and Shenzhen. Apart from wine trading and distribution, wine-related businesses also include auction, retailing, catering, transportation, warehousing and education. This year's Wine & Spirits Fair will feature more than 30 group pavilions of wine-producing regions, trade organisations and governmental organisations from around the world. There will be new pavilions by the Syndicat General des Vignerons de la Champagne, France (SGV), Southern United States Trade Association, the Russian Export Center, Enterprise Mauritius, Confederacao dos Agricultores de Portugal, Setubal Peninsula Wines, Portugal, and Asociatia Producatorilor si Exportatorilor de Vinuri, Romania. Among the new pavilions, the SGV will feature seven growers from four wine regions. It will also host Champagne tastings at the newly launched Champagne Avenue and introduce visitors to Champagnes by small and medium wine-producers. The Ministry of Agriculture, Forestry and Food of the Republic of Slovenia returns this year to showcase various wines made from honey, and will set up a "Bee World Pavilion" to promote World Bee Day to raise awareness about the importance of beekeeping in agriculture. -"Mori no Kanade," a sparkling sake from Japan. This wine is the result of five years of research and development. This traditional Japanese rice-based alcohol has evolved into the first-ever sparkling sake with secondary fermentation in Suntory's Hakushu Distillery whisky barrel. In addition, a wide assortment of exhibits from around the world will be displayed at the fair. Apart from the Liquor & Beverage Products zone, there will be zones that promote the industry's all-round development, including Wine Education, Wine Investment, as well as Wine Accessories Equipment and Services. 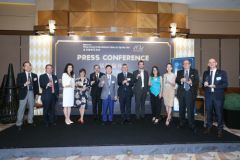 At the 10th anniversary of the Wine & Spirits Fair, the HKTDC has teamed up with the Hong Kong Polytechnic University School of Hotel and Tourism Management (SHTM) to co-organise the Asia Wine Academy. Based on the SHTM's MSc in International Wine Management programme, two intensive courses, "Contemporary Trends in Wine Consumption" and "Mastering Tasting & Rising Wine Trends," will be conducted by Masters of Wine Jeannie Cho Lee MW and Steve Charters MW. Participants who complete the courses will be awarded a certificate. At the Wine Industry Conference on the first day, Debra Meiburg MW, will host a session titled "Trends to Watch in 2018: The Business of Bubbles and Beyond." Speakers will share their insights on the prospects of different wine varieties, with a focus on sparkling wines. A Gala Wine Dinner bearing the theme "Cabaret Festival" will follow the cocktail reception. Guests will enjoy a menu prepared by two Michelin-starred Chef Fabrice Vulin from the French restaurant, The Tasting Room, at the City of Dreams Macau. The Hong Kong Wine Competition will also be held during Public Day to promote wine culture and wine knowledge. Public visitors can join seminars, wine tastings and master classes, whisky and cocktail demonstrations and Champagne tastings to enrich their knowledge of wine. Debra Meiburg MW will host a Master Class that day, while Sarah Heller MW will host a seminar titled "What Makes a Good Wine?". Hong Kong Wine & Spirits Writers Association Chairman Ronny Lau will speak on the topic "How a Hongkonger Made Wines in Italy." Public visitors can also purchase tickets for the Wine & Spirit Fair at the HKTDC booth at the Hong Kong Wine and Dine Festival for HK$200 and enjoy a "Buy 1 Get 1 Free" discount. In addition, they can enrol in the Asia Wine Academy at a group-buy price of HK$690 (original price: HK$990) through the Wine & Spirits Fair website or via online group-purchase platforms, Timable, Feedme Guru or TnG. Participants will receive a complimentary Wine & Spirits Fair ticket and a Lucaris crystal wine glass valued at a total of HK$1,300 on a first-come, first-serve basis and while stocks last.